Don’t miss the HCA Concert Series featuring Michael Lewin at 2pm prior to the Women’s Art Association of Hamilton exhibition opening. Traditions transcend time and connect people in the present day with the values or customs of the past. Traditions can be inherited and deeply embedded from family and culture. Some traditions can be new for people, learned from friends, organizations or the community we become a part of. 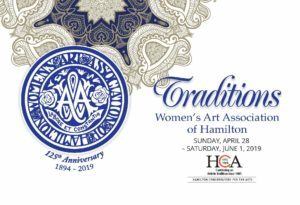 The Women's Art Association of Hamilton has been part of the art scene in Hamilton for 125 years. WAAH was created in 1894 by a group of ambitious and affluent women. Today WAAH is a collective of talented artists and art enthusiasts. WAAH artists exhibit an array of work throughout the Hamilton area. Working together to help advance women in the arts.